Grove Park Pocket Parks. 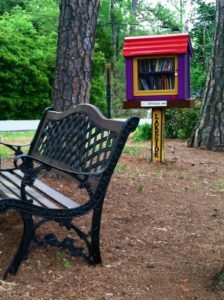 Neighbors can gather at our two “pocket parks” to meet neighbors or sit quietly while enjoying a book from one of our Little Free Libraries. Pocket parks are located at the Triangle (Terry Lane & Lakeside Drive) and the Circle (Oakwood & Shady Lanes). View a map of the pocket parks here. Delta Creek Park. 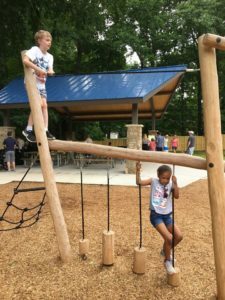 Officially opened in 2018, Delta Creek Park is our very own neighborhood park operated by Mecklenburg County Parks & Recreation. Delta Creek is a great place to meet Grove Park and Ravenwood neighbors, enjoy local wildlife, host a birthday party, get in a morning workout, and much more! Located on Linda Lake Drive @ Williams Road. Click here to reserve the Shelter for your family’s event. Hickory Grove Recreation Center. Located less than a mile from Grove Park, the recreation center offers soccer and baseball fields, track, an indoor hardwood gymnasium and computer lab. Reedy Creek Park. This nearby 146 acre park has 10 miles of hiking trails, disc golf, a fishing pier, picnic shelters, a Nature Center and much more. Charlotte Museum of History & Hezekiah Alexander Home Site. Located in our community off of Shamrock Drive, visitors can enjoy docent-led tours of the historic house, the museum itself, and numerous special events throughout the year. 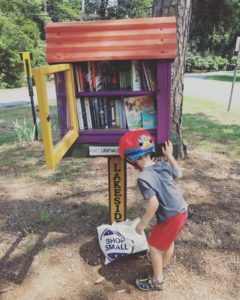 View a map of our Little Free Libraries here. Charlotte Mecklenburg Library, Hickory Grove Branch. Just down the street at Hickory Grove Rd & Harris Blvd. 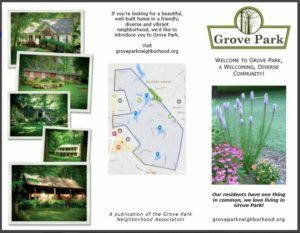 The Grove Park Neighborhood Association has created a Real Estate Brochure to help promote the neighborhood to realtors and prospective home buyers. Ravenwood Neighborhood is Grove Park’s next door neighbor(hood).